This is our 26th year of business and without you, our dedicated customers, this would not be possible. So, Thank You from the bottom our hearts. As our direct business continues to serve you through the convenience of our secure online shopping site as well as via phone, mail or fax, there are many former retail customers who may not know that our business continues as steadfast as ever. Should you be able to pass the word along that these European Crafted Spiegel Appointment Books are definitely available direct, we will be ever appreciative of this help in reaching others. Our inventory is somewhat limited and we are adjusting our supply each year in relationship to demand. We encourage you to order early in the season to ensure you receive the product color of your first choice. Our season begins in September right after Labor Day and continues into early Spring or whenever inventory sells out. 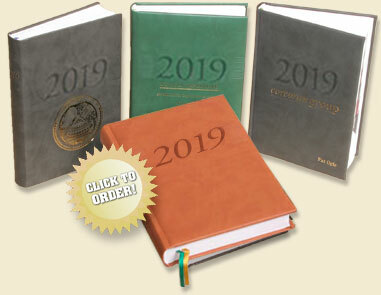 If you have a need for previous year books some inventory is available online or by calling us direct. Our imprinting services include logo as well as name personalization's. This is an excellent way to enhance your own book or add that special touch to those books given as personal or business gifts to others. We look forward to serving you with this added service. Our Appointment Books make great daily planners, diaries, or journals and as a bound hard copy legal complement to your electronic devices. You can find out about the many features as well as placing your online order for our Appointment Books by following the links in the navigation menu.